The Red Sox announced that they’ve signed right-hander Rick Porcello to a four-year contract extension that covers the 2016-19 seasons. Porcello, a client of Excel Sports Management’s Jim Murray, will reportedly receive $82.5MM over the four-year term of the contract. He’ll first receive a $500K signing bonus before earning $20MM in 2016 and 2017 then $21MM in 2018 and 2019. Porcello was already slated to earn $12.5MM this season after avoiding arbitration this winter, and that salary remains intact. For the 26-year-old Porcello, there’s certainly risk involved in taking a long-term deal at this juncture, as he was set to hit the open market just six months from now at the age of 27. However, while he’d have had a chance at a lengthier deal, the $20MM+ annual salary is likely one that few would have foreseen a year ago, when the former first-round pick entered the season with a career 4.51 ERA and a career-high of 182 innings. Last year’s excellent performance turned Porcello’s fortunes, however, as he worked to a career-best 3.43 ERA in a new career-high 204 2/3 innings. Porcello averaged 5.7 K/9, 1.8 BB/9 and posted a 49 percent ground-ball rate in 2014 — a significant step forward for a pitcher that many have believed to have untapped potential prior to last year’s breakout. Porcello will surrender his first four free agent seasons by signing this deal — and perhaps the ability to lock in a $100MM+ contract next offseason — but he’ll retain the right to hit the open market again at the age of 30, setting him up for another significant contract. 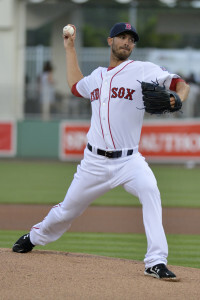 Beyond that, however, is the fact that Porcello seems genuinely excited to be a member of the Red Sox. In a Players Tribune article that he penned himself, Porcello explains that the dedication to winning he’s seen since the day he joined the Red Sox played a major role in his decision to sign a long-term deal now, thereby forfeiting the exceptionally rare opportunity to be a 27-year-old free agent starting pitcher. While the Red Sox will certainly hope the early stages of his contract go better than this comparison, the contract isn’t entirely dissimilar, philosophically, from the one signed by Homer Bailey a year ago. Cincinnati paid what most considered to be market value for Bailey, tacking five years and $95MM on top his final arbitration year, despite relatively underwhelming career statistics. The hope in that contract, as is the case with this deal, is that recent steps forward will be sustainable, if not a portent for even further development. From the Red Sox’ perspective, the deal provides them with additional certainty in their rotation in the long-term. They’ll now have Porcello under control through 2019, Wade Miley and Joe Kelly under team control through 2018, and Clay Buchholz under team control through the 2017 season. It’s also another example of the Red Sox’ preference to avoid investing in pitchers in their 30s and their preference to limit the length of long-term contracts (in this case, likely at the expense of a higher average annual value). That last item is probably the key to this deal. There will undoubtedly be detractors who focus on the contract’s average annual value as opposed to limiting the risk by minimizing the years and investing in prime seasons rather than potential decline years. It’s certainly possible that the contract will look poor at some point over the life of the deal, but it’s roughly the same figure for which James Shields signed, and Porcello is seven years Shields’ junior. And while Porcello clearly lacks the type of track record that Shields and other veteran free agents will typically sign for, such contracts typically begin at the time Porcello’s current deal will end. It wouldn’t be a surprise for a prime-aged Porcello to outperform an aging veteran that might be more typically expected to sign this size contract, and Boston certainly seems to be of the belief that betting on those prime years, particularly in terms of starting pitchers, is a better route than paying premium prices for potential decline years. Alex Speier of the Boston Globe reported the financial details of the contract (Twitter links). Jon Heyman of CBS Sports reported the limited no-trade clause (also on Twitter).